Welcome to the InterContinental Chicago Magnificent Mile, one of the most beautiful and iconic, landmark hotels in history. Originally built in 1929 as the Medinah Athletic Club, the luxury men's club catered to members of the Shrine organization. At 42 stories, the extravagant love child of famed architect Walter W. Ahlschlager and interior designer Walter Ingtrup, was one of the first skyscrapers in the country. Unfortunately, in 1934 the club had been a victim of the stock-market crash and was forced to close its doors. InterContinental Hotels, renowned for its international portfolio of extraordinary restorations, bought the property in 1989, and immediately began renovations. A quarter of a billion dollars later, and just one year's time, this truly magnificent InterContinental Chicago hotel was re-introduced to Chicago. It was the contribution of the original athletic club's 1930 yearbook, the SCIMITAR, which guided the original restoration work. Donated by a club member, the book was of invaluable assistance during the restoration process. Its black-and-white photographs were used to duplicate and restore entire rooms, right down to the detailing in draperies and carpets. Lido Lipe, who assisted in restoring the Sistine Chapel, was also brought in to restore the gold leafing, chandeliers, and murals that adorn the grand ballrooms and adjoining foyers. Completed in 2001, the four-story lobby, with grand staircase and cast bronze ornamentation, has resulted in harmonious merging of old-world elegance with 21st century craftsmanship. 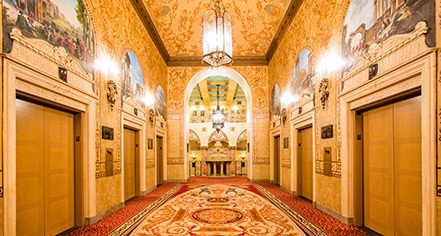 Today, each floor of the historic hotel in Chicago represents a myriad of cultures and eras. The public areas available for viewing provide a glimpse of the rich history of the building. When the InterContinental Chicago Magnificent Mile opened its doors in 1990, it was presented as a gift to the city of Chicago. Since then it has been the recipient of numerous awards for both its architecture and design. It has been the scene for important events, and the landmark hotel's guests have included international dignitaries, politicians, and Hollywood celebrities. InterContinental Chicago stands proudly among the other InterContinental restorations around the world, including the Willard InterContinental in Washington, D.C., the Mark Hopkins InterContinental San Francisco, Le Grand InterContinental in Paris, and many more. InterContinental Hotels Group operates more than 150 hotels on six continents. 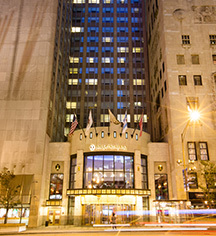 InterContinental Chicago Magnificent Mile, a member of Historic Hotels of America since 2011, dates back to 1929. The original Tarzan, Olympic swimmer Johnny Weismueller, was known to train in the 14th floor junior Olympic size pool. This was the first pool built above ground into a skyscraper and was considered an engineering feat during its construction in 1929. Accessible Rooms: Twenty two (22) accessible rooms are available. Please notify request at time of booking. Airport Shuttle: Available upon request; fees apply. Hotel/Resort Fees & Taxes: Taxes: 17.4%. Parking: Hourly rate available; $68 overnight valet parking. Complimentary vehicle charging stations. Pet Policy: Service animals allowed: Yes. Pets allowed: Yes. Deposit: $100 per stay; Grand Tower only. Rollaways: Available upon request; surcharge ($50). Welcome to the InterContinental Chicago Magnificent Mile, one of the most beautiful and iconic, landmark hotels in history. Originally built in 1929 as the Medinah Athletic Club, the luxury men's club catered to members of the Shrine organization. At 42 stories, the extravagant love child of famed architect Walter W.
Learn more about the History of InterContinental Chicago Magnificent Mile .